Red Kite Hall is one of the area’s finest detached modern residences arranged over three floors, occupying a private position with outstanding views landscaped gardens ample parking, double and single garage, say agents Hopkinsons. 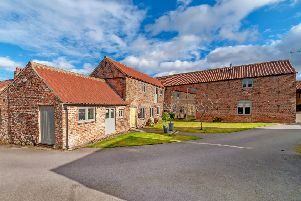 It features a family gym, impressive lounge, feature open plan Clarity Arts fitted kitchen, reception hall, guest cloaks/shower room, utility room. Three of the bedrooms have en-suite facilities and there are two further bedrooms and luxury bathroom. Phone 01423 501201.